Engineered for ultimate smoothness and durability, with special corrosion-resistant stainless steel ball bearings, heat-resistant carbon drag washers, and oversized stainless steel bail wire. Super-light magnesium body and rotor, machined-aluminum spool, 10-bearing system with one-way clutch, Sure-Click titanium line roller, and FREE aluminum spare spool. "i saw this reel before it came out and i was sceptical of how it would handle and it delivered 10fold" "
"Having owned a Pfleuger President Ultra-Light set-up, I was already impressed with what Pfleuger has to offer. This reel did not disappoint." "After a couple of fishing trips, the gears started grinding and the side plate near the handle came apart when I caught a 1 lb. drum. It is under warranty, I have only had it for about a month." 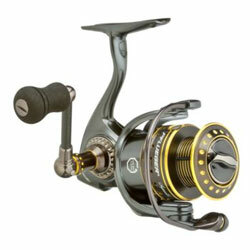 "I was very excited to see a revised version of Pflueger's Supreme Mg spinning reel. However, now that I finally own it there isn't much to rave about. "